For contractors, one of the most important documents to know, and understand, is your commercial general liability (CGL) insurance policy. The CGL policy is equally important to general contractors, subcontractors, residential contractors, commercial contractors and public works contractors. Failure to purchase the correct type of CGL for your business, and to understand your rights and obligations under your CGL, may lead to catastrophic results. When it comes to insurance, like in so many other instances, you truly get what you pay for. In order to avoid the pitfalls of CGL coverage, and risk paying for a worthless insurance policy, it is always worth the time to sit down and read that behemoth that you may have thrown in a drawer the moment that you received it. If you don’t, it may just put you out of business. Risk allocation is a necessary part of the bidding and pricing process. That means that the insurance ramifications for the project almost always will have a direct impact on your bottom line. Failure to understand and identify risk, and to properly allocate the risk, may lead to higher costs for the project. Prudent contractors will anticipate, and plan for, time and legal fees associated with insurance disputes, including property damage and bodily injury. When evaluating risk, the contractor should evaluate the hold harmless provisions of the contract, the indemnification provisions, the insurance requirements and the bond requirements. A proper allocation of risk, and achieving a balance between contractual safeguards, sufficient insurance and sufficient bonding requirements, will allow the contractor to minimize its risk to the greatest extent, thus allowing of the potential greatest net profit. Insurance requirements should always be specifically identified in the contract documents prior to execution. Some items that should be addressed included worker’s compensation, CGL coverage and amounts, umbrella/excess requirements and amounts and automobile coverage and amounts. Additionally, careful attention should be paid to the indemnification clause in the contract. As most contractors know, the indemnification clause is a contractual provision providing that the contractor will defend and/or indemnify its client (and sometimes others in the contract chain) from liability, costs and damages arising out of the contractor’s work. But not all indemnification clauses are created equally. In construction, risk typically flows downhill. The owner usually will not defend or indemnify anyone. Instead, the owner is usually contractually required to be defended and indemnified by everyone below it in the contract chain. The general contractor, on the other hand, will agree to defend and indemnify the owner but will also require those below it on the contract chain to defend and indemnify the owner and the contractor. Those at the bottom of the contract chain, including subcontractors and sub-subcontractors, typically are not being indemnified by anyone but, instead, will be indemnifying everyone above them in the contract chain. Builder’s risk insurance is a special type of insurance that can be purchased during construction that protects against damage to the structure while it is under construction. Builder’s risk is available on an “all risk” or “named-peril” basis. All risk tends to be more common in the industry because it provides for losses other than those caused by a specific excluded event. Some common exclusions to builder’s risk policies include asbestos, collapse, pollution, flood, earthquakes, subsidence and theft. Where excavation work will be performing, or where any type of underpinning or shoring is necessary, care should be taken to assure that the insurance policy at issue does not contain an “earth movement” exclusion. The earth movement exclusion provides that there will be no coverage for any loss that is based upon the movement of earth. There are different definitions of exactly what constitutes the movement of earth. Prior to 2009, some policies were not specific as to exactly what “earth movement” entailed. After a New York Court of Appeals decision found that the intentional removal of earth by man (excavation) was not earth movement, many policies were rewritten and now specifically state that earth movement includes earth movement that is both naturally occurring or due to manmade causes. In close urban construction environments, such as New York City, the earth movement exclusion can subject both developers and contractors to significant liability for which there is no coverage. The decision to purchase a builder’s risk policy should be made early on and should be factored in the allocation of risk between the owner and general contractor as well as to the contract price. The employer’s liability exclusion: One version of this exclusion, common in many CGL policies, states that if an employee of a named insured is injured, no coverage will result. Since most people that will be injured on a construction sites are employees of an insured, this provision needs to be carefully read and understood. The cross liability exclusion: One version of this exclusion, also common in many CGL policies, states that the insurance will not provide coverage for injury to a present, former, future or prospective officer, director, stockholder or employee of any insured. This provision could literally be interpreted to void coverage against just about every person that should be on a construction site. The ongoing operations exclusion: This one is less common, but still deadly. It states that any injury that results from work being performed on a building greater than 2 stories will not be covered. For commercial contractors, this exclusion is particularly deadly because most commercial work involves going higher than 2 stories. The heading is also misleading and could lead to not fully understanding that the exclusion even applies. If you perform work at or above 2 stories and this exclusion is in your policy, get it out or get a new policy! The contractual liability exclusion: This exclusion exists in various forms. One form states that the policy will not cover losses that arise out of liability assumed in a contract. In other words, if the contractor agrees to defend the owner in its contract, and the owner is sued for an injury on the site, the owner will then sue the contractor for indemnification. But the contractual liability exclusion will exclude coverage for the owner’s claim against the contractor. Some versions of the exclusion will state that agreements in which the contractor “assumes the tort liability of another” will be covered, but not all versions contain such language. For a price, this exclusion can usually be removed or modified – but you have to read your policy to know that it’s there. Chinese drywall exclusion: “Chinese drywall” is a phrase that many contractors have probably heard of but probably never thought to look at their insurance policy to see if it was mentioned. The Chinese drywall exclusion says that there is no coverage for losses arising out of, or caused by the use of, Chinese drywall. The classification limitation: Coverage is limited to the classification of specific operations that were identified (i.e. carpentry, demolition, excavation, etc.). If the contractor, for any reason, is engaging in a different type of work, the loss may be excluded from coverage. How many contractors think to check their original application for insurance to see what how they described their operations and make sure that if it has changed, to notify their insurer before taking on a project with different classifications? Keep in mind that this is not just an audit premium issue, this exclusion can void coverage. The phrase “horizontal exhaustion” most likely means very little to many contractors. If they saw the phase in their contract documents or in their policy documents they may not have taken a second glance. Not understanding horizontal exhaustion is a mistake. In short, horizontal exhaustion means that everyone’s primary insurance policy on a construction project must pay out first before there is a secondary (excess) liability triggered. This includes payment of not only all subcontractor policies, but of the general contractor’s primary policy as well. This legal concept is particularly important because many construction contracts require vertical exhaustion – the opposite of horizontal exhaustion. That means that if you do not address the horizontal exhaustion issue before entering into the contract, you may walk on to the site and be in material breach of contract from day one. So the natural question for the contractor looking to avoid the vertical exhaustion issue is what can I do about it? The first, proactive step, is to have your policy amended and have an endorsement issued that says your excess/umbrella carrier waives horizontal exhaustion and that it will contribute to the loss on a primary and non-contributory basis to the contractor’s additional insureds. The problem with such a request is that there is no guarantee that the insurer will provide the endorsement and, even if they will, there could be a significant cost increase to the policy premium (perhaps 20% or more). The second step is to make sure that your policy does include contractual liability coverage, and that the contractual liability covers contracts in which you “assume the tort liability of another.” By doing so, you have preserved your ability to trigger your excess policy through a doctrine known as the circuity of litigation. While understanding circuity of litigation is outside the scope of this article, suffice to say that the contractual liability coverage will give you a fighting chance against an insurer claiming that it does not have to pay out because of horizontal exhaustion. A certificate of insurance confers no additional insured (“AI”) rights or status. Only an endorsement to the policy will confer AI status unless the policy has a self executing/effectuating AI provision. Almost all policies issued to contractors in New York require that subcontractors specifically name the general/prime contractor as an additional insured on its policy and provide the general/prime contractor with a written hold harmless agreement. Failure to obtain the necessary insurance and hold harmless agreement from the subcontractor could have one of two effects depending on the policy language: 1) there could be no coverage to the GC under the GC’s policy; or 2) there is coverage to the GC but an audit will be performed and a premium charged to the GC at the highest allowable rate. The above concepts are only a few of the more common, and important, topics in understanding insurance in the construction arena. The best way to make sure that your company is fully protected is to sit down with your attorney and your insurance broker before any problems happen and make sure that your policy protects you and that your policy satisfies your contractual obligations. In the end, remember, cheaper is not always better when it comes to insurance. 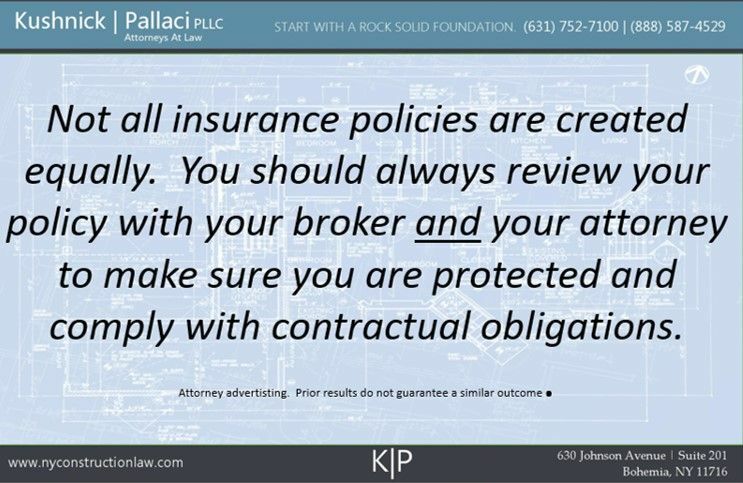 The construction attorneys at Kushnick Pallaci regularly review insurance polices and counsel their clients on the issues their policies present and their compliance with contractual requirements. We also handle insurance coverage litigation disputes where insurance coverage for an occurrence may have been improperly declined. You can contact us here to discuss your insurance issues now. This entry was posted in Construction Litigation, Construction Safety, Insurance, Uncategorized and tagged Insurance by VTP. Bookmark the permalink.